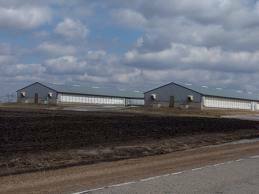 (Spencer)– We have word this (Tues.) afternoon New Fashion Pork has apparently withdrawn its application to build a 4,400 head hog operation on the Iowa/Minnesota border in Superior Township, in the far northeastern corner of Dickinson county. Assistant County Attorney Lonnie Saunders tells KUOO news he was notified by a staff member of the Iowa Department of Natural Resources’ Spencer Field Office that New Fashion Pork has requested it’s permit application be withdrawn. The application drew considerable opposition at public hearings the Dickinson County Board of Supervisors conducted in December. Opponents sounded off on concerns over the environment, possible manure runoff into tile lines that drain into the Des Moines River, property values and other issues. The board of supervisors then voted in favor of disapproving the Master Matrix scoring that was used in the site.